BIG PROMOTION. [! ]EVER FAITH is a Europe registered trademark and Ever Faith is its only owner. We will pursue legal action against trademark infringement in case of UNAUTHORIZED sale or resale. Made of crystal. Popular material used frequently in jewelry. Intended Use: Wedding/Mothers-day/Valentines-day/Anniversary/Birthday/Cocktail Party/Prom/Remembrance Day. Wrapping: Come With Some Spare Crystals, and a Gift Box or Favor Bag (Depend on Product Size). This unique V-shaped design is a perfect choice of womens jewelry to be worn on your wedding day. You will be dazzle and shine in this art deco bridal set. 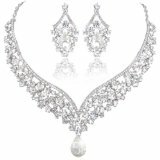 Bling crystal make a sensational choice on your wedding day to wear for a bridal necklace and earrings. As a company that concentrates on Fine and Fashion jewelry, we already have about 10 years experience on fashion jewelry trend. We work magic on jewelry, keep on new designs and to a leader of beauty and style is our goal. We have over 5000 products and are good at sustaining innovations. Ever Faith’s pieces are those that are bought, worn, collected, cherished and treasured. You will never be regret if you take some times to look at our store and be surprised to find so many unique design. The copyright of the model picture belongs to Ever Faith. Reproduced without authorization prohibited.